rittenhouse square — Ferrarini & Co.
Project Summary: This project consisted of major construction (removal of load bearing walls, etc.) which all proved to be well worth it for our client and her family (including the family dog). Every room in the house was segmented and felt very isolated. By partially removing two walls and adding a window seat this allowed the family to be in separate rooms while still feeling connected. Design Narrative: Entertaining in a bathroom never looked so good. Probably a thought that never crossed your mind, but a space as unique as this can do just that. The fusion of so many elements: an open concept shower, freestanding tub, washer/dryer organization, toilet room and urinal created an exciting spacial plan. Ultimately, the freestanding tub creates the first vantage point. This breathtaking view creates a calming effect and each angle pivoting off this point exceeds the next. Following the open concept shower, is the washer/dryer and storage closets which double as decor, incorporating mirror into their doors. The double vanity stands in front of a textured wood plank tile laid horizontally establishing a modern backdrop. Lastly, a rustic barn door separates a toilet and a urinal, an uncharacteristic residential choice that pairs well with beer, wings, and hockey. - Add a washer/dryer closet for easier use. - Incorporate a urinal for large entertaining of male sports events. - Create more storage opportunities. - Create balance and flow between each piece so the space does not feel overwhelmed with so many design elements. - The placement of the entry door forced us to be conscious of the view while standing at entrance. - The home was built in 1915, making the toilet and other items more complex to relocate. - An angled closet and herringbone flooring directs your focus as you enter the space towards the tub, juxtaposed between two windows so it doesn’t crowd the room, making spacial planning key. - Tucked away are the areas that require more privacy: the toilet/urinal area and the shower. - In order to relocate the toilet, we built a small soffit in the kitchen to host the toilet drain line which was then decoratively disguised. - The flooring is a perfectly laid and visually charged herringbone pattern of dark bardiglio marble. 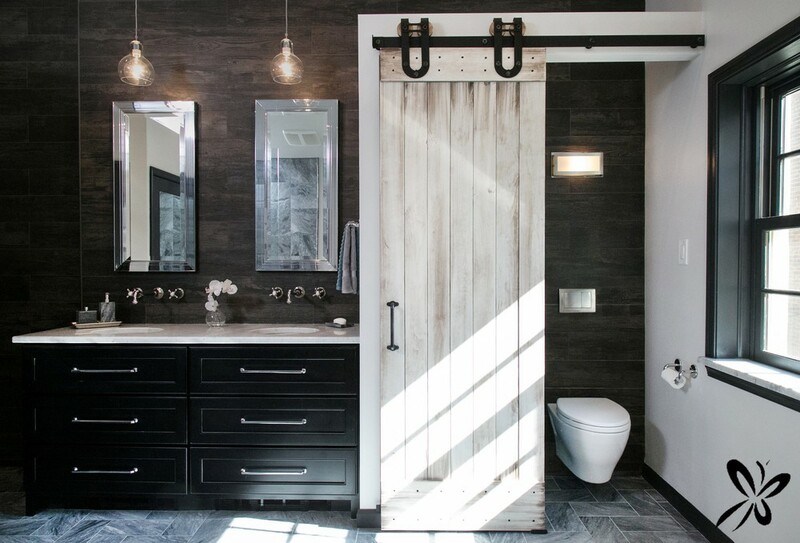 - The sliding barn door produces a necessary division between the toilet and urinal space. - The original brick left exposed easily incorporates itself into the overall picture of elegance and detail.